The Wednesday, June 20, 2018 Climate Justice Forum radio program, produced by regional, climate activist collective Wild Idaho Rising Tide (WIRT), features talks by anti-tar sands megaload, Montana author David James Duncan on the Heart of the Monster, and by indigenous, Minnesota pipeline opponent Winona LaDuke on the next energy economy. We also share news and reflections on upcoming, WIRT and allied meetings, presentations, and fundraisers, an Idaho hearing on the Avista sale to a Canadian utility, 2018 Washington train collisions with pedestrians and vehicles, and longer freight trains across the U.S. Broadcast for six years on progressive, volunteer, community station KRFP Radio Free Moscow, every Wednesday between 1:30 and 3 pm Pacific time, on-air at 90.3 FM and online, the show describes continent-wide opposition to fossil fuel projects, the root causes of climate change, thanks to the generous, anonymous listener who adopted program host Helen Yost as her KRFP DJ. The Wednesday, June 13, 2018 Climate Justice Forum radio program, produced by regional, climate activist collective Wild Idaho Rising Tide (WIRT), features news and reflections on railroad bridge and track construction around Cocolalla and Pend Oreille lakes, Moscow and Sandpoint #No2ndBridge discussions, allied, June fundraising events, Dakota Access and other pipeline leaks during 2017, a tribal, anti-pipeline rally in Great Falls, Montana, Louisiana resident resistance to the Bayou Bridge pipeline, tree-sitter blockades of an Appalachian pipeline, anti-G7 protests in Quebec, and a G20 agreement to invest in fossil fuels. Broadcast for six years on progressive, volunteer, community station KRFP Radio Free Moscow, every Wednesday between 1:30 and 3 pm Pacific time, on-air at 90.3 FM and online, the show describes continent-wide opposition to fossil fuel projects, the root causes of climate change, thanks to the generous, anonymous listener who adopted program host Helen Yost as her KRFP DJ. 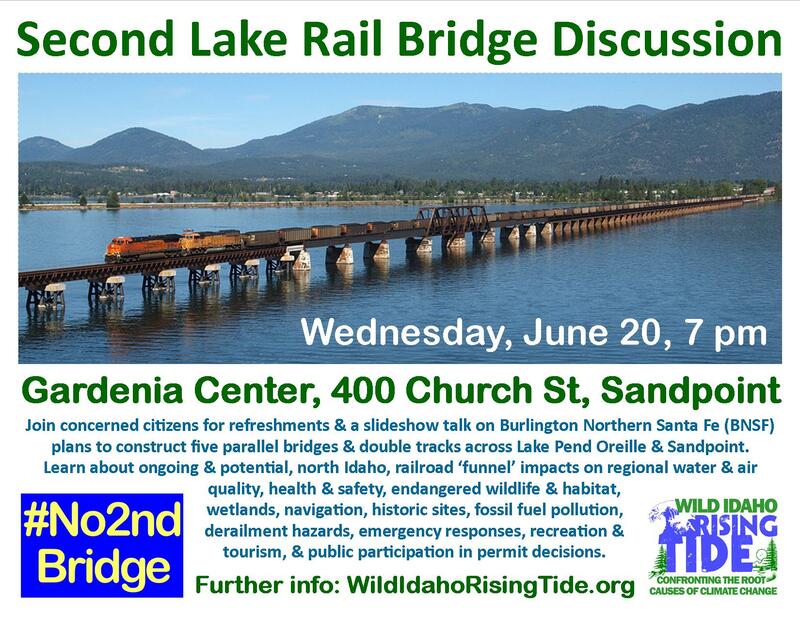 The Wednesday, June 6, 2018 Climate Justice Forum radio program, produced by regional, climate activist collective Wild Idaho Rising Tide (WIRT), features recorded, Idaho Department of Lands hearing testimony on proposed, Sandpoint area, railroad bridge and track construction, and news and reflections on a second lake rail bridge discussion in Moscow, a teen injured by a Washington train, a lawsuit against the Newport silicon smelter land sale, Forest Service approval of exploratory, silica drilling near Lake Pend Oreille, a Boise visit by EPA head Scott Pruitt to transfer federal, water pollution authority to the state, and small nuclear reactors planned for Idaho. Broadcast for six years on progressive, volunteer, community station KRFP Radio Free Moscow, every Wednesday between 1:30 and 3 pm Pacific time, on-air at 90.3 FM and online, the show describes continent-wide resistance to fossil fuel projects, the root causes of climate change, thanks to the generous, anonymous listener who adopted program host Helen Yost as her KRFP DJ. 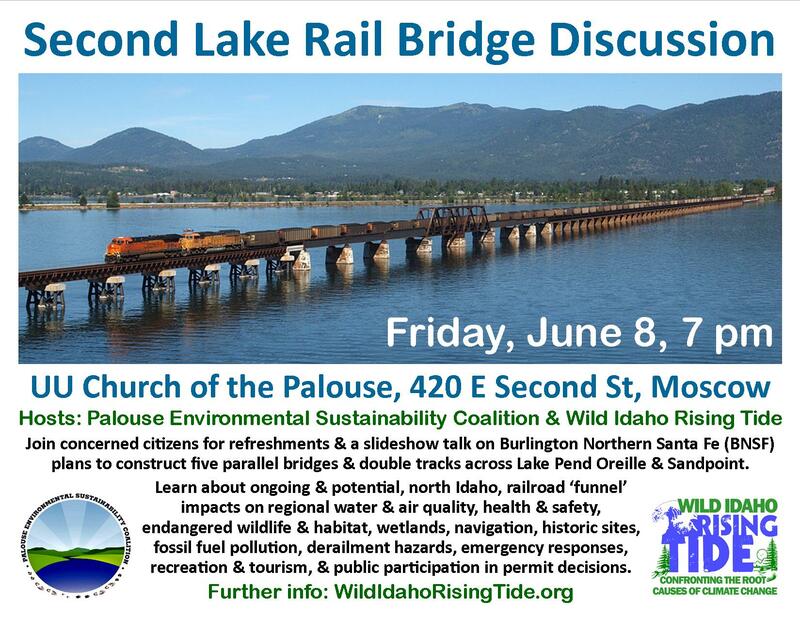 At 7 pm on Friday, June 8, please join Palouse Environmental Sustainability Coalition (PESC), Wild Idaho Rising Tide (WIRT), and concerned community members and activists for refreshments, an open meeting, and a slideshow presentation about Burlington Northern Santa Fe (BNSF) Railway plans to construct two temporary and three permanent, parallel bridges and two miles of doubled tracks across Lake Pend Oreille, Sand Creek, and Sandpoint, Idaho. PESC and WIRT event hosts will provide snacks, offer printed material, and accept admission donations at this free event that opens at 6:30 pm, at the Unitarian Universalist Church of the Palouse, 420 East Second Street in Moscow. Through images and stories, learn about the ongoing and potential, significant impacts of north Idaho, railroad ‘funnel’ infrastructure, transportation, and expansion on regional, lake and aquifer water supplies, air quality, noise, public and environmental health and safety, threatened bull trout and fish and wildlife habitat, wetlands and shorelines, indigenous rights, historic sites, fossil fuel trains and pollution, derailment hazards, emergency responses, vehicle traffic, boat navigation, recreation and tourism, businesses and residences, and other relevant, public interest factors. Consider how you can participate in state and federal reviews and permit decisions on BNSF applications for the proposed Sandpoint Junction Connector project, ideally analyzed through an environmental impact statement, as requested by the City of Sandpoint. For further event and issue information, please print, post, and share the accompanying, PDF flyer, check for updates on WIRT facebook and website pages, and visit the PESC and WIRT outreach tables at Moscow Farmers Market on Saturday, June 9, and at the Farmers Markets in Sandpoint and Moscow throughout the season. We hope to talk with you about this critical situation at all these events!